Hillary Clinton made history on Thursday when she became the first woman to formally accept the presidential nomination of a major political party. Yet while Clinton was pushing through the glass ceiling in Philadelphia, some men just couldn't resist resorting to one of the oldest bits of cliched sexism around — telling a woman to smile. Yes, that's right, while the first female presidential nominee of a major political party spoke passionately about her qualifications, her policies, and the country's need for "steady leadership," a group of clueless men took to Twitter to tell Clinton to smile more during her Democratic National Convention acceptance speech. Presidential candidates are often tossed to the wolves, so to speak. Their policies are ripped to shreds and their legislative records closely scrutinized. But male politicians have yet to endure the same type of sexist critique cast upon Clinton. 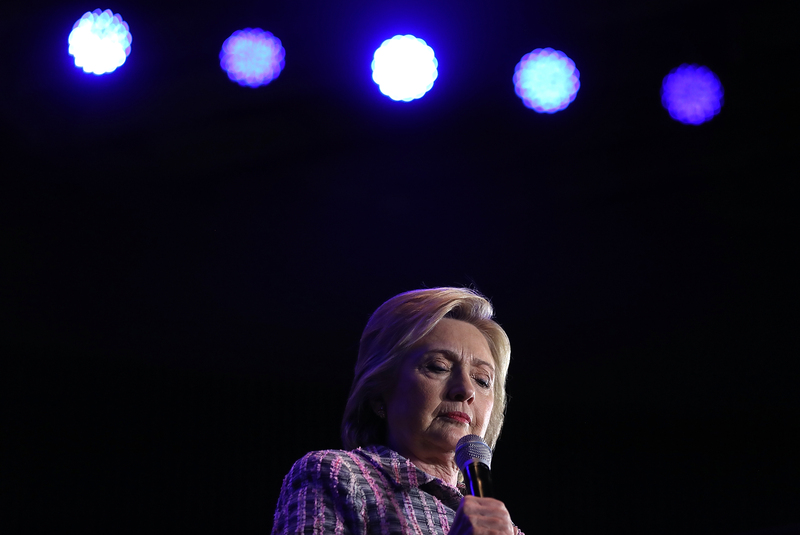 Despite having served as both a member of the Senate and secretary of state, Clinton is repeatedly criticized for her love of pantsuits, her tone of voice, and her facial expression. While no one would dare suggest Republican nominee Donald Trump "just smile a bit more," some male pundits have continually claimed Clinton could stand to appear more cheerful, more happy, more warm and friendly. Yet, suggestions that Clinton "smile more" are merely poorly disguised requests for a powerful female politician to appear as non-threatening as possible. Some men still found fault with Clinton's facial expression even when she did smile, proving that when it comes to sexist cliches, you're damned if you do and damned if you don't. While sexist retorts like "smile more" may still be thrown into conversations about powerful women nowadays, they're thankfully seen by many as inappropriate. Many (women and men) took to Twitter Thursday night to help educate those who seemed confused that smiling was a qualification mandated for a woman looking to run the country. Some sought to highlight the double standard behind critiques Clinton should smile more. It really says something that minutes after a woman has made history and put perhaps the biggest crack in the glass ceiling, she's told to smile a bit more. It's an exasperating sexist cliche that many women can, unfortunately, relate to. But the truth is women — not even one gunning for your vote — are under no obligation to smile.